Protesters lay down their hats outside the Metgasco office in Johnston Street, Casino in protest against coal-seam gas mining. SEVENTY-year-old Frances De Glas has never in her life taken part in a civil protest, but yesterday she decided it was time she took a stand against coal-seam gas. Ms De Glas was one of up to 100 people who gathered outside the Casino office of CSG company Metgasco yesterday morning to demand answers to their questions regarding the controversial industry. 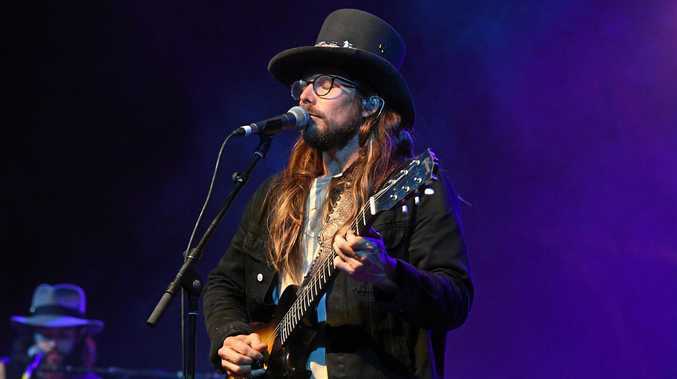 There they waved placards, ate cake and, in the context of their long fight, had their spirits lifted by passing motorists encouraged to "toot for no coal-seam gas". 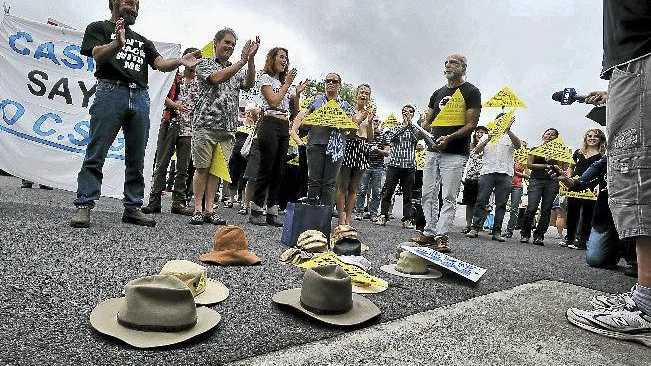 They also marched to the front door of the Metgasco office, handing over a list of questions they want answered, and symbolically laid down their hats. "We are sending a clear message to Metgasco, the council and all politicians regardless of their party, that the community has had enough," Richmond Valley Group Against Gas spokesman Dean Draper said. "We demand answers to our concerns right now, before any further gas-mining development takes place." Mr Draper also claimed Metgasco had not consulted with the community on its plans for the region. At the door of Metgasco, Eric van Beurden, also of the Richmond Valley group, said the questions could not be answered without further research. "They can't be answered until a whole lot of research is done and if they can't be answered then we believe we should stick to the precautionary principle and stop mining in this area," Dr van Beurden said. But Metgasco accused the protesters of spreading misinformation and accusations without a factual basis. "Metgasco has and will do its best to operate in an open and transparent manner," Metgasco chief Peter Henderson said. "Indeed, with the level of government reviews and community consultation processes that are required before developments can proceed it would be difficult to operate in a different way." Mr Henderson also said CSG can and is being managed safely and has a positive impact on local communities. But Ms De Glas was not convinced. "I think (CSG) is the greatest threat to all our futures and I cannot believe the politicians are so politically immoral that they let it happen," she said. "I have a great concern about toxins entering the artesian basin. "We will all be gone if we lost the artesian basin; we will never recover." She also encouraged others who have never taken part in civil-protest action to get involved. "I would encourage them to come along because there is a lot at stake," she said. "There are other groups if they don't want to stand on the street like I did and wave a placard." Metgasco will respond to the protesters questions in a special report in The Weekend Star on Saturday.